A few weeks ago, amid the usual headlines about cleansing and detox, there was at least one promising trend: a bunch of articles on increasing beneficial bacteria in the gut. One such article, which ran in the New York Times, was titled “A Gut Makeover for the New Year.” It noted that, when scientists compared the gut microbiota of people eating standard American diets versus those eating a lower-calorie, plant-based diet, they found the latter group to have richer and more diverse populations of beneficial bacteria. 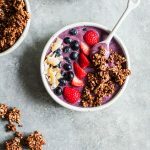 The article went on to share tips for strengthening one’s microbiome, including the sensible advice to eat more fruits, vegetables, whole grains, legumes, and nuts—eat plants, in other words. Folks who are already eating lots of plant foods can give their gut health an additional boost by eating plenty of prebiotic foods (these include dandelion greens, sunchokes, alliums, asparagus, barley, and apples) and incorporating more fermented foods into their diets. Fermented foods include sauerkraut, kimchi, and lacto-fermented vegetables, as well as miso, tempeh, kombucha, pickles, natto, and non-dairy yogurt. They’re rich in the beneficial bacteria that can do so much good for our immune systems, and they happen to be intensely flavorful, too—which means that they easily add character to everyday meals. When I first developed a taste for fermented foods, I got a little carried away. 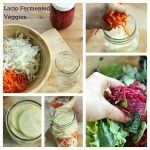 I was pleasantly surprised to realize that it’s easy to make lacto-fermented vegetables at home (there’s a tutorial in my archives, for anyone who’s interested), along with sauerkraut (I love Elenore’s recipe). For a while, there was always a quart sized mason jar or two of vegetables sitting in the warmest part of my apartment, getting tangier by the day. I’ve fallen out of the habit over time. I don’t have a good excuse, except that I’ve been juggling a lot of cooking this year, and at a certain point anything that was non-essential started to fall by the wayside. Still, I’ve missed having lots of fermented cabbage, beets, and carrots around. I probably didn’t realize how much I missed them until I got a chance to experience the ready-to-eat sauerkraut from Farmhouse Culture. The folks at Farmhouse Culture are leaders in cultured foods and vegetables. They make five varieties of sauerkraut and kimchi and a line of probiotic-rich “gut shots.” As the year gets underway, they’re rolling out a new line of cultured veggies that includes curry cauliflower and ginger orange carrots, as well as probiotic-rich “kraut krisps” for healthful snacking. All of the krauts and gut shots are organic, non-GMO, vegan, and gluten free. I love that these products make it easier for consumers to get to know fermented foods. I knew so little about them before I became vegan: my only experience was probably low-fat yogurt and sauerkraut on hot dogs when I was a kid. It took me a while to warm up to kimchi and kraut, in part because they weren’t easy staples to find at the time, and I wasn’t ready to make my own. It’s cool that these foods are so widely available now. Getting one’s hands on fermented foods is the first step toward eating them more often. The second step is to come up with fun, easy ways to enjoy them! 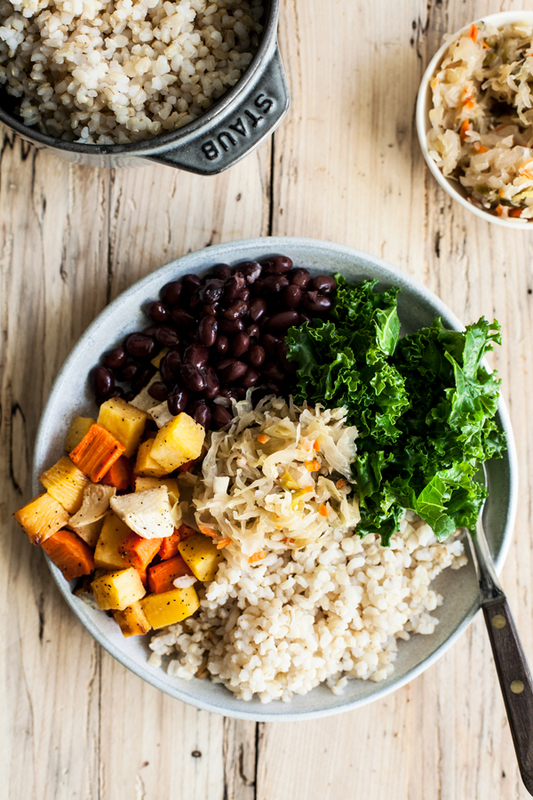 The good news is that fermented veggies can be added to nearly any meal, from salads to bowls to noodles, and you don’t need a special recipe to make it happen. Here are five of my favorite ways to incorporate kimchi and kraut into my everyday breakfasts, lunches, and dinners. 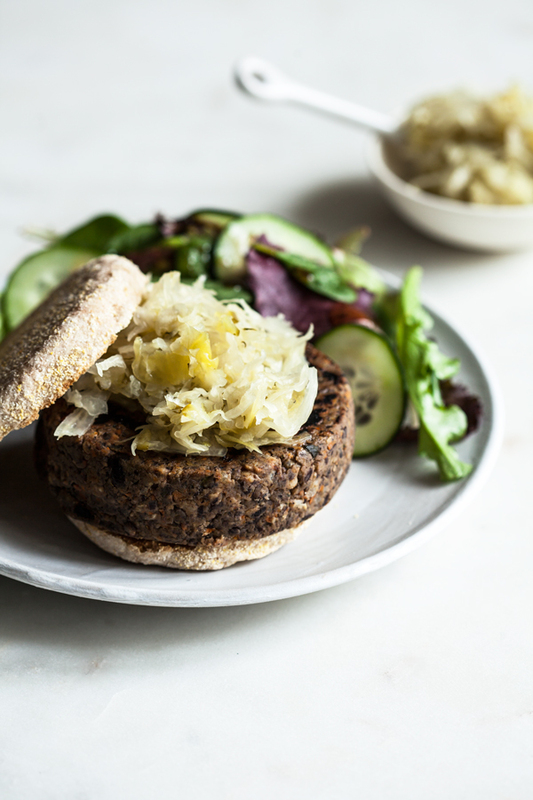 Sauerkraut is a great topping for any plant-based burger; it adds flavor and healthful bacteria in one fell swoop. This one is served on an English muffin and topped with the Farmhouse Culture classic caraway kraut. 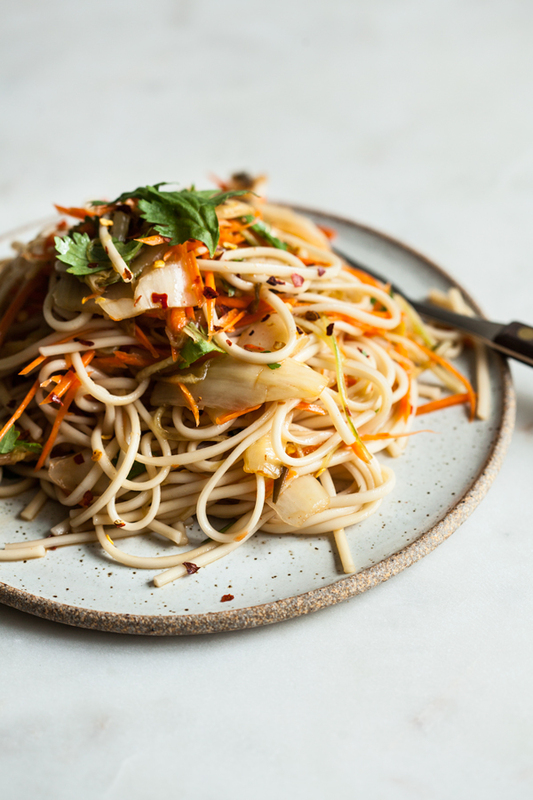 Amanda recently gave me the inspiration to fold kimchi into a noodle dish with her spicy 10-minute kimchi noodle salad. To make my own version, I boiled udon noodles and tossed them together with about a half cup of chopped kimchi, a few tablespoons of kimchi brine, a teaspoon of toasted sesame oil, and freshly grated carrots and cucumber. I finished it with a splash of tamari, crushed red pepper, and cilantro. It was a terrific, speedy homemade lunch. I read Julia Turshen’s Small Victories this fall and immediately fell in love with her recipe for kimchi toast (in addition to the many other smart ideas she has for using kimchi, which is clearly one of her favorite ingredients). Julia’s version includes an ingenious mayonnaise drizzle that’s spiked with kimchi juice. I keep mine a little more basic: I mash half of a large avocado with some lemon juice, spread it on toast, top it generously with kimchi, and finish it off with my homemade gomasio. Easy peasy. 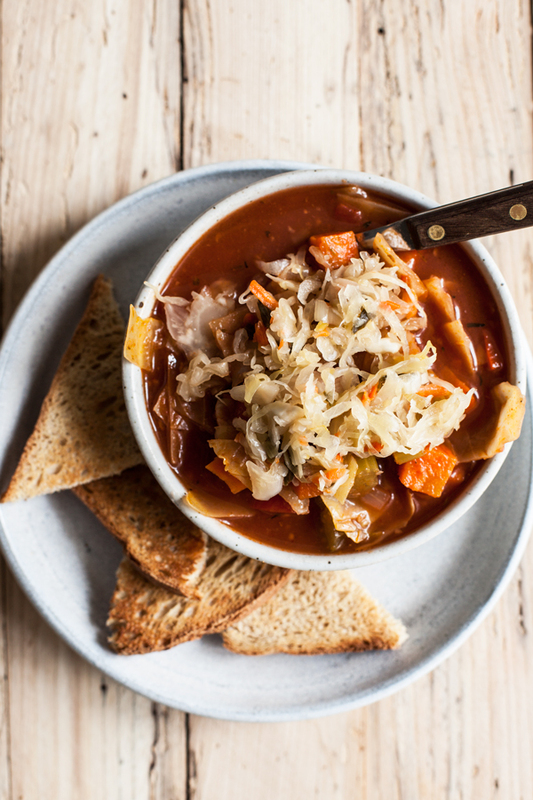 I’ve been experimenting lately with a recipe for wintery tomato cabbage soup. It’s been through a few iterations now, and I recently had the thought to double up the cabbage and top a bowl with sauerkraut. The kraut added a nice layer of acid to my bowl, along with spice, since I used the Farmhouse Culture horseradish leek kraut. I’m guessing that any variety of kraut would work equally well with a noodle or a bean soup. 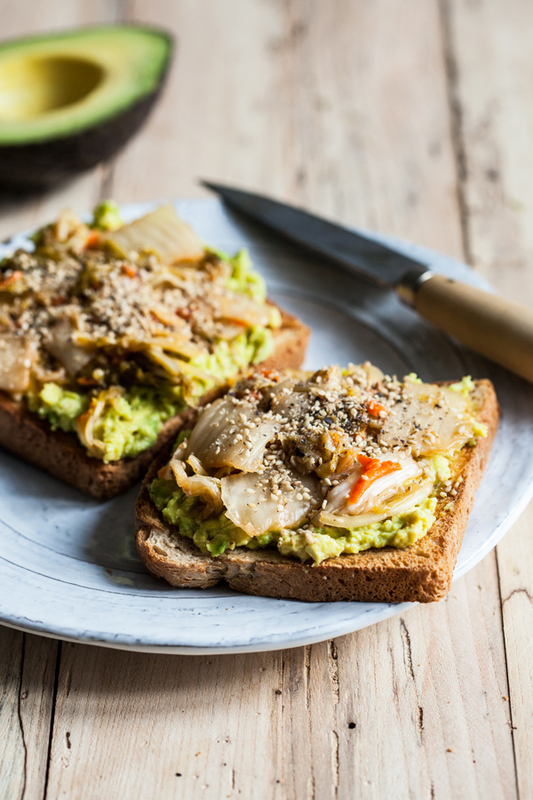 Getting more fermented veggies at lunch or dinner may seem perfectly sensible, but for breakfast? It sounds a little out there, I know. Then again, what’s a better way to start the day than with gut-strengthening food? 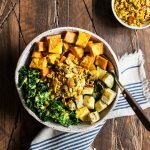 Breakfast macro bowls—any mixture of cooked rice or quinoa, legumes, steamed kale, and root vegetables—are a wintertime favorite of mine (in fairness, I’m equally likely to eat them at lunch and dinner, but I do love the way they set me up to feel warm, grounded, and nourished as I begin the day). As I got to know the Farmhouse Culture krauts, it occurred to me that any one of them would enhance my usual bowl. I’m so glad I tried it. 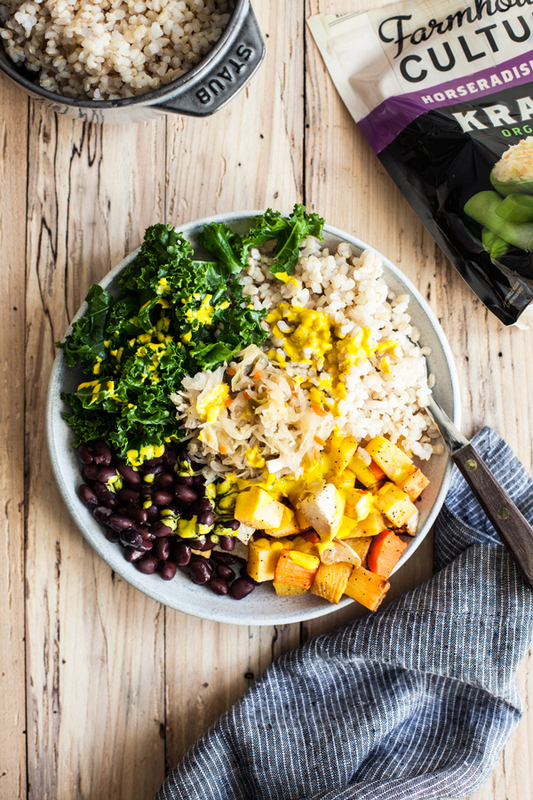 The kraut adds salty, tangy flavor that’s a perfect contrast to the earthy simplicity of a macro bowl. 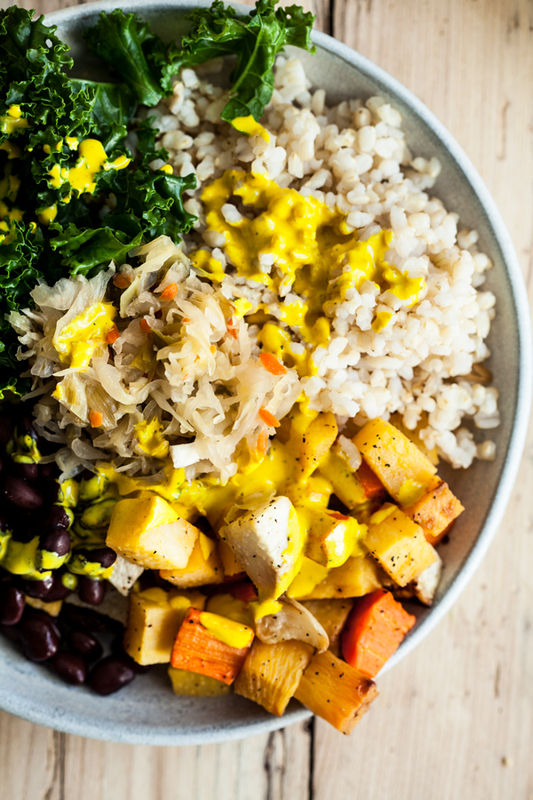 I gave my bowls a drizzle of yum sauce because I’m hooked—I’ve been putting it on everything lately—but the kraut alone would add tremendous flavor to this simple, nourishing bowl meal. Preheat your oven to 425F. Cook the rice according to package instructions or by using this method (which is my go-to for short-grain or medium-grain rice). Toss the cut root vegetables with the oil. Transfer the vegetables to a lined baking sheet and sprinkle with sea salt and pepper. Roast for 35-40 minutes, or until they’re tender and browning at the edges, stirring once halfway through baking. Bring a pot of water to boil and fit it with a steamer attachment. Steam the kale for 3 minutes, or until it’s tender and bright green. 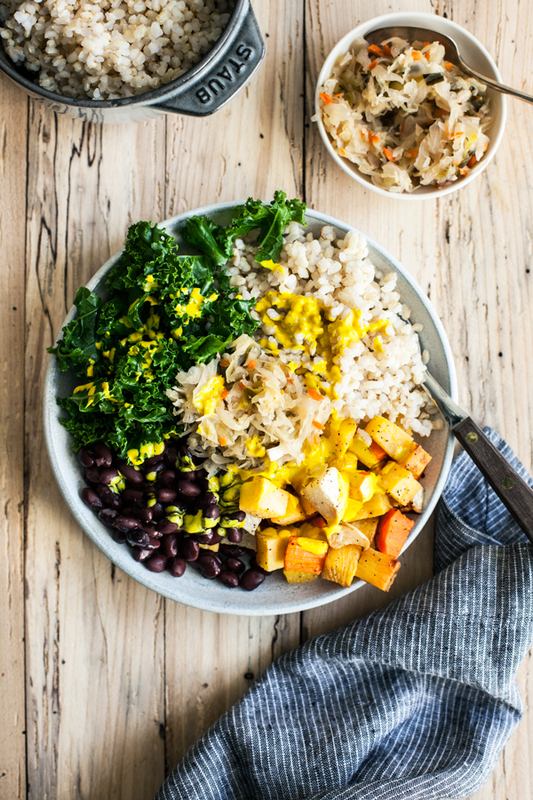 Divide the cooked rice, roasted vegetables, kale, and black beans into four bowls. Top each with a scoop of the fermented vegetables, then drizzle with yum sauce or other toppings of choice. Serve. 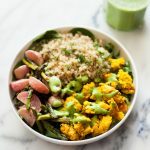 This bowl has all of the culinary building blocks of gut health: plenty of fiber, a perfect balance of plant-based ingredients, and the easy addition of fermented veggies. Whether you plan to make your own fermented veggies or explore some of the great options that are available in stores these days, I hope this post sparks some inspiration on using kraut and kimchi in an easy, low-stress way. Here’s to good gut health for all of us in 2017! This post was sponsored by Farmhouse Culture. All opinions are my own, and I love this line of ready-to-eat fermented food. Thanks for your support! WOW! I’ve always told myself I need to add more fermented foods in my diet, but none of the recipes ever looked super appetizing…until now. I LOVE the idea of a kraut burger – and I’m always down for a micro bowl. Thanks for the inspiration! This post is packed with so much goodness Gena. I flipping love Farmhouse and eat their caraway kraut with my dinner macro bowl every night! So passing along this link to friends, I love how you use them in every recipe here. Hope you’re having a super fun and joyous week girl, lots of hugs. This is a wonderful reminder that I need to up my sauerkraut intake! One question, do you know if the good properties of sauerkraut and/or kimchi are compromised when heated? I just tried out Farmhouse’s Kraut (smoke jalapeno one!) and I have to say, I’m in love! I never usually go for fermented things, the bite never really appealed to me, but this one has me hooked. I love all the info about fermented foods, I always kind of forget about them..but they are so so good! very good information! Health and nutrition information is usually just repetitive weight loss and exterior body sculpting with little time left to describe or even recognize the microscopic, thank you for this valuable information and very creative recipes, need help wading into kimchi! I relate so much to this. When I first started making my own ferments, I had a really organized cycle of ferments going and always made sure to have at least a jar going in our basement while we ate from one in the fridge. I’ve gotten a little lazy, but your post here is reminding me about all of the benefits and how much it adds to a meal. I was just reading through Small Victories as well and the kimchi avo toast got put of my list of things to try as well. As always, your posts are always so helpful and inspiring, Gena! Love this idea of a macro breakfast. I know the value of a protein and greens based breakfast to ensure we maintain our blood sugar levels and keep us fuller for longer. As a vegan I have tried a few breakfast protein options, from Tofu scramble to cooked Quinoa. 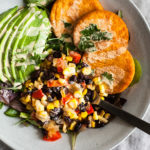 I really like the use of the black beans in this dish, and definitely give it a go thanks!! I love using sauerkraut in my breakfast! This bowl looks absolutely delicious and I can’t wait for my breakfast tomorrow. Thanks for sharing!